In case you've been wondering (I know how you stay up late at night biting your nails and worrying about stuff like this), I have still been doing the October Dress Project. I just haven't had time to post anything about it. But have no fear! 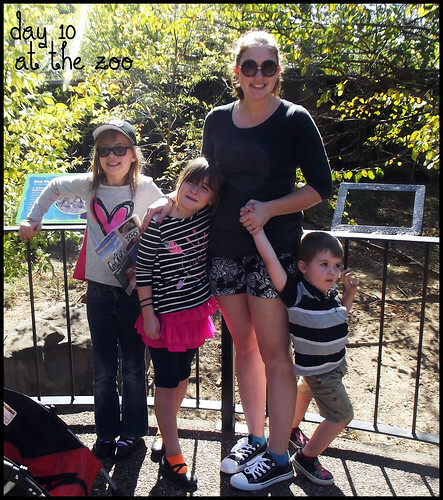 As I sit here with hair dye on my roots and a pumpkin loaf in the oven, I present you with Days 8 through 12. 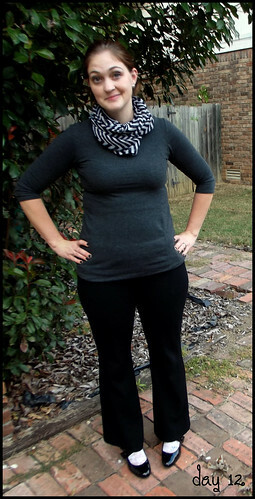 I wore The Dress as a shirt with black trousers, black patent heels, lacy white socks and a black and white chevron infinity scarf. My hair was down when I started the day, but it ended up in a ponytail by the end of it. Because stress. A dress for Sunday! Which is kind of silly since a Sunday dress infers churchgoing, and I don't churchgo. I did however attend a fundraiser full of cupcakes, and cakes are one of the major pluses of churchgoing. 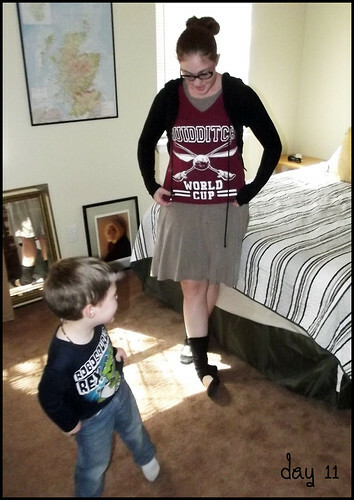 I wore The Sunday Dress under a Quiddich World Cup t-shirt (dork), with black legwarmers, flats and a black zip-up hoodie (until it got warm). Hair was meh. No makeup. Easy like Sunday morning. Pink Out! Our work was doing a Pink Out day on Friday for the Race for the Cure (on Saturday), and we were supposed to wear pink. 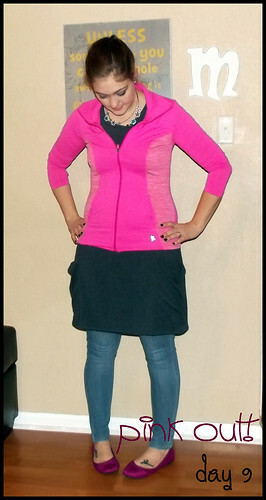 I wore The Dress with a pink workout jacket, skinny jeans, and totes adorbs pink flats ($9.99 at Payless, holla!). I put my hair in a loose, sideways French braid. I love casual Friday. Since I started every other day with an exclamatory sentence fragment: Conference Day! I organized the photography for one of our company's initiatives at a conference on Thursday morning, so I wanted to dress a little smarter than usual. 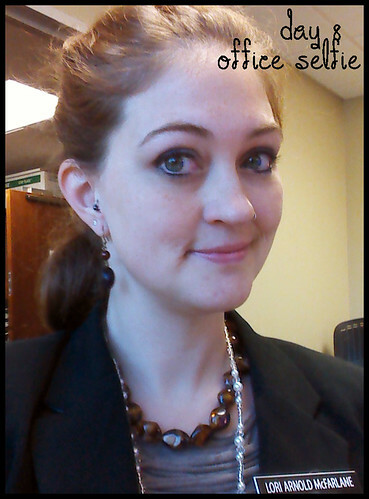 I don't think I succeeded, but in effort, I wore The Sunday Dress with a black blazer and brown chunky necklace. (I know, black and brown!) 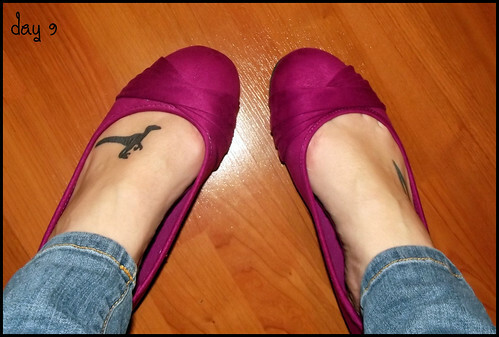 Not visible in the photos are my beige patent wedges. Not my best outfit at all and not my best photies. We were running late that morning. I managed a surreptitious office selfie. 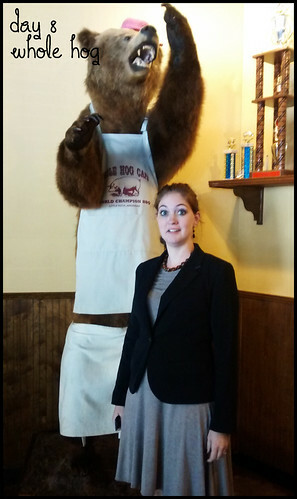 I also got Scott to take my picture in front of a big bear chef at lunch, so there's that too. 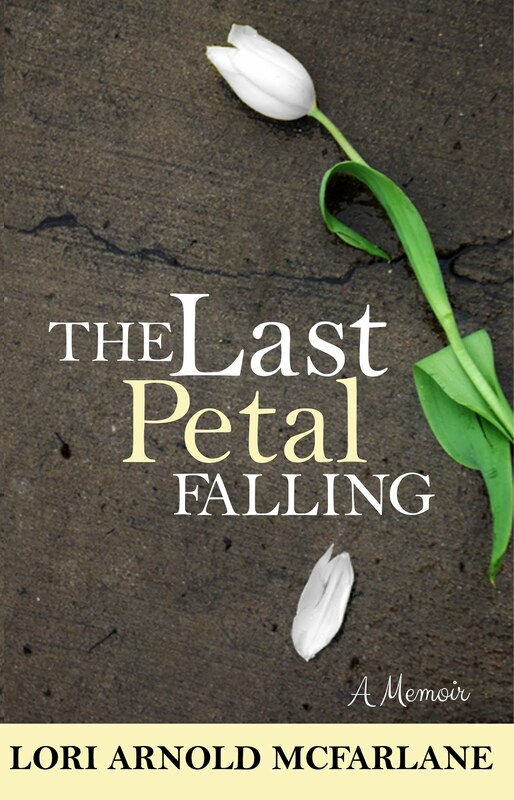 And with that, I'm almost halfway through. What?! I'm not even tired of The Dress(es). Yet. Let the October Dress Project Commence!